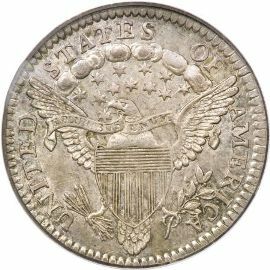 The Draped Bust Half Dime Heraldic Eagle version was produced from 1800 to 1805 after the small eagle variety. 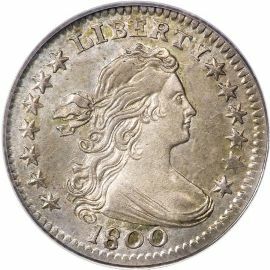 Coins dated 1800 are usually higher quality and better struck. All further issues from 1801 to 1805 are lightly struck at least in some areas. The obverse of these silver coins is the same as the previous issue with the exception of the number of stars. This variety has 13 6-pointed stars throughout its production years. with wings spread. A row of clouds connect the wings from tip to tip, with 13 stars below the clouds. The eagle also has within it's talons a group of arrows on the left and an olive branch on the right.